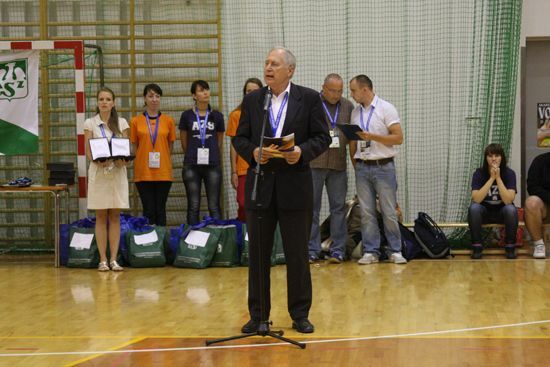 The 10th European Universities Volleyball Championship has concluded on July 29 2010 with an exciting Closing Ceremony in Szturmowa SC in Warsaw. In men finals, the champion title went to Mordovskiy State University who won a final match against Eindhoven University of Technology. This breath-taking match finished with the result 3:0. In women finals, the champion title went to Bahcesehir University who won the final match against University of Belgrade 3:0. Medals and awards were presented by EUSA Delegate Mr. Wolf Fruhauf, EUSA Technical Delegate Jean Loup Miquet and Jacek Kasprzyk Treasurer of University Sport Association of Poland, chief of Warsaw University Sport Association Włodzimierz Leśniewski and vice rector of Warsaw University Tadeusz Tomaszewski. In the end, EUSA flag was passed to Milica Terzic, the captain of the University of Belgrade team, as the next EUC Volleaball will take place in Kragujevac where university teams across Europe are invited to participate in 2011. More info can be found at http://volleyball2010.azs.waw.pl.